Who's with me? 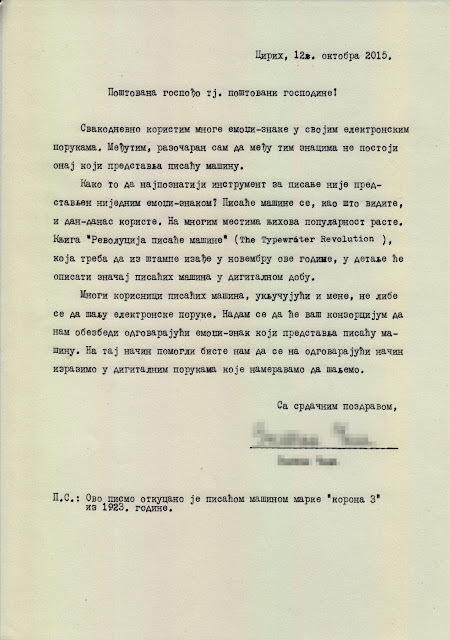 Let's help some Silicon Valley bureaucrats have a more interesting day. Any letters or postcards you choose to share with me will be posted below. Thanks to Peter E. for his swift typewritten action! 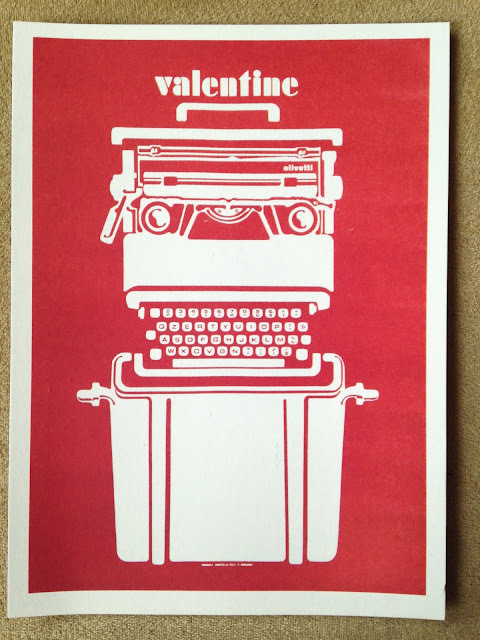 PS: For the sad end to the typewriter emoji saga, read this post. Certainly a typewriter would be far more useful than the "Lion Face". And that is a set of smiling and laughing faces, in case it doesn't show up for anyone. You may have already researched this, but it turns out that it's possible to submit a specific application for an emoji character to be added to the standard. 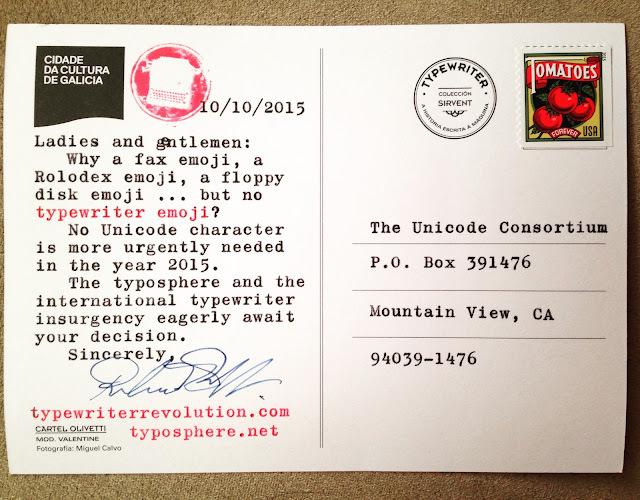 The generic instructions are here: and the parts that apply only to emoji are here: It looks as though the right way to move things forward would be to submit a formal proposal, probably after working through the emoji selection guidelines and at least preparing an argument why the typewriter would meet them. On my first read, I think it looks like we'd have a fairly strong case. Thanks, but it looks like your links disappeared. Oops. Let's try this: http://unicode.org/pending/proposals.html and http://www.unicode.org/emoji/selection.html perhaps? 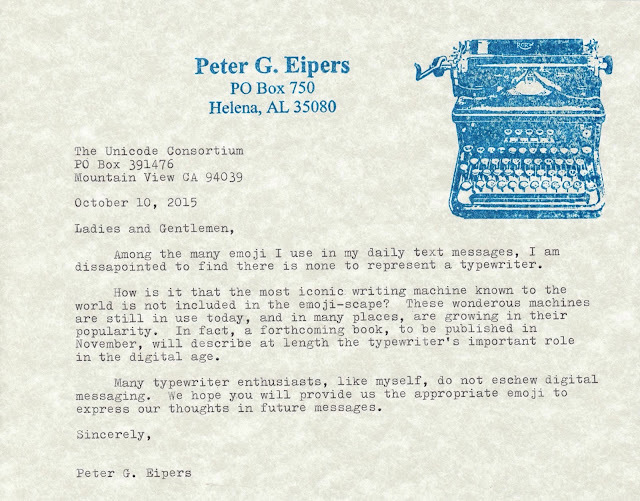 I hereby put forth the candidacy of the Underwood No.5 as the emoji face of typewriting. After all, post-Underwood most machines changed to the same general form factor and the No.5 is one of the most common machines out there. I agree, the Underwood no. 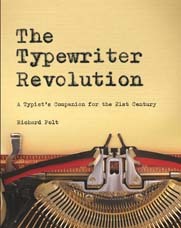 5 would be a great choice as the proto-typical typewriter.